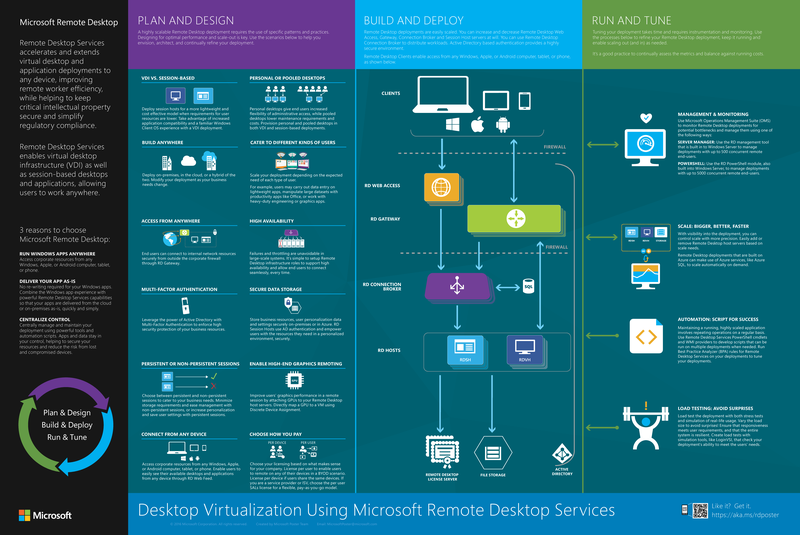 The Remote Desktop Services team have created a poster to help you plan, build, and run your RDS environment. You can get a copy of the poster by right-clicking the image and saving it to your local system. You may have heard us talk about a new “modern infrastructure” for Remote Desktop. Maybe you've heard us use the phrase “RDmi.” The phrase you need to know is “Windows Virtual Desktop." Learn about this new virtualization offering in Microsoft 365 adds modern desktop on Azure and our Ignite 2018 presentation on Windows Virtual Desktop. Windows Virtual Desktop is currently in private preview.